13.6" x 17.1" stitched on 14 count. 10.6" x 13.3" stitched on 18 count. 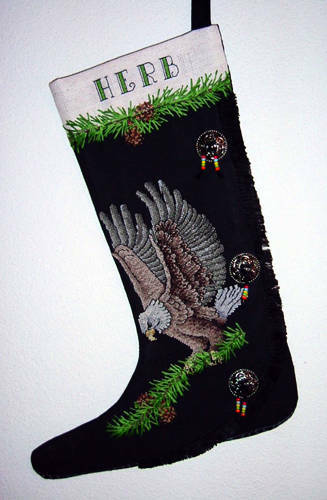 Eagle Moccasin Stocking cross stitch pattern... Finished size is 12" x 16.5" (30.48 cm x 41.91 cm) stitched on 14-count Black Aida cloth and 14-count Fiddler's cloth. Top and bottom are stitched separately and joined together with pine needles applied over cross stitches.